For those who are slightly, if not extremely excited to see the beloved Capt. Jack Sparrow return to the silver screen next summer, by all means, read on. Disney has been shooting the fourth Pirates of the Caribbean: On Stranger Tides in Hawaii for a few months now and is preparing to release it right in the thick of summer, as always. To start hyping a new sequel, Disney has debuted a new skull & crossbones teaser poster for the film. I wasn't too impressed with the last two films in this series, so when I heard they were continuing the story, I rolled my eyes in disappointment. However, I've been warming up to the idea, and now I'm pretty excited for it. I think it could be a strong, well done film. Here's hoping. We should see the trailer soon too. Can't wait for that! Also, below is a clip from our beloved Capt. himself. He gives us a little insight into what the movie will entail. It's pretty fun, so check it out. Enjoy! The Plot: Captain Jack Sparrow (Johnny Depp) crosses paths with a woman from his past (Penélope Cruz), and he's not sure if it's love -- or if she's a ruthless con artist who's using him to find the fabled Fountain of Youth. When she forces him aboard the Queen Anne's Revenge, the ship of the formidable pirate Blackbeard (Ian McShane), Jack finds himself on an unexpected adventure in which he doesn't know who to fear more: Blackbeard or the woman from his past. 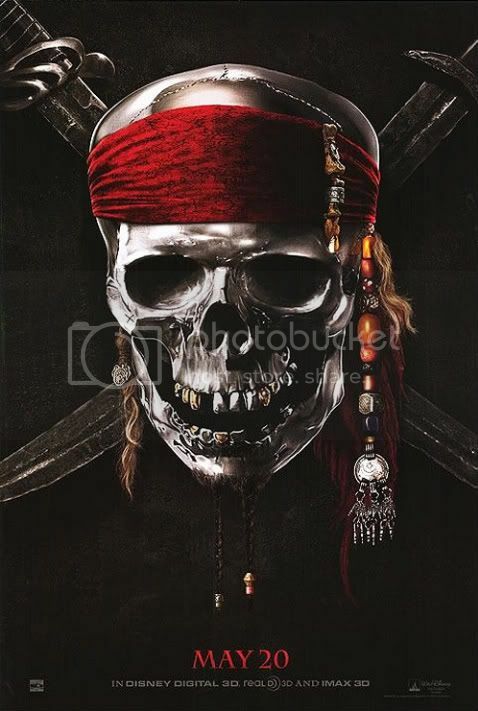 Pirates of the Caribbean: On Stranger Tides stars the lovely Johnny Depp as Capt. Jack Sparrow again as well as Penélope Cruz, Ian McShane, Geoffrey Rush, Judi Dench, Keith Richards and Astrid Berges-Frisbey as a mermaid. The story is based on Tim Powers' book. Rob Marshall (Nine and Chicago), is directing the fourth Pirates of the Caribbean film and is said to be shot entirely in 3D. If that's the case, it should be pretty rad to watch in 3D. This film is set for release on May 20th, 2011.